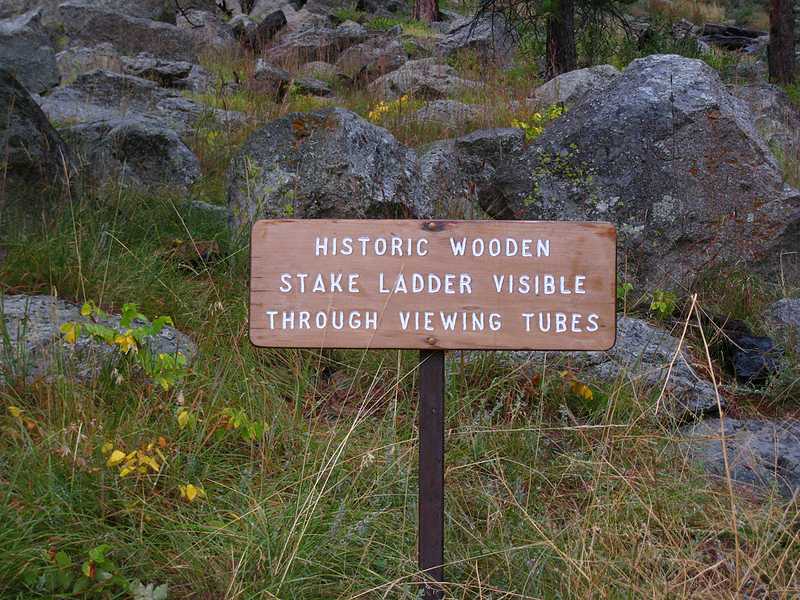 The Antiquities Act was also a bold expansion of executive powers concerning the removal of land from private or “wise use” (e.g., National Forests) enterprises. President Theodore Roosevelt, who signed the Antiquities Act into law on June 8, was not shy about using it. Roosevelt would ultimately declare fifty National Monuments, six of which (including Grand Canyon, Pinnacles, and Olympic) would later be upgraded to National Parks. The presidential power embedded in the Antiquities Act remains controversial, with the Republican-controlled House of Representatives within the past two years voting to hobble the act by making National Monuments subject to congressional approval. 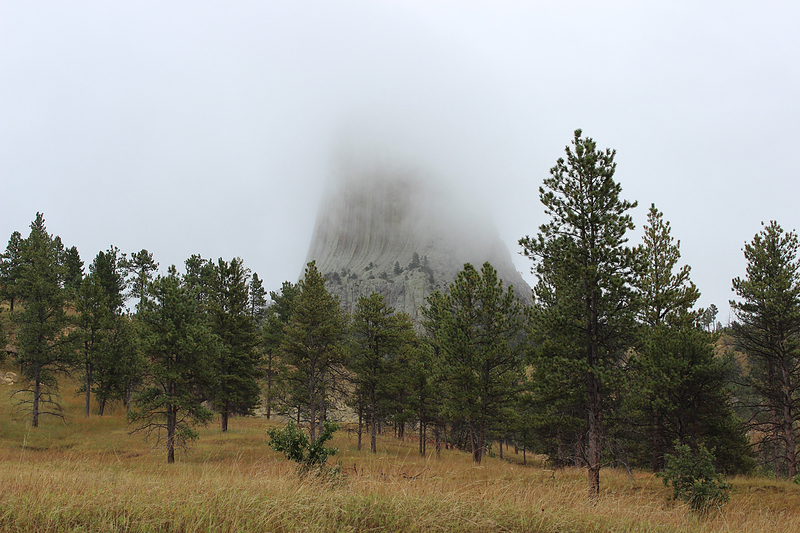 On September 24, 1906, Roosevelt declared the first National Monument, Devils Tower, a striking igneous intrusion that rises over 1,200 feet above the high plains of Wyoming west of the Black Hills. 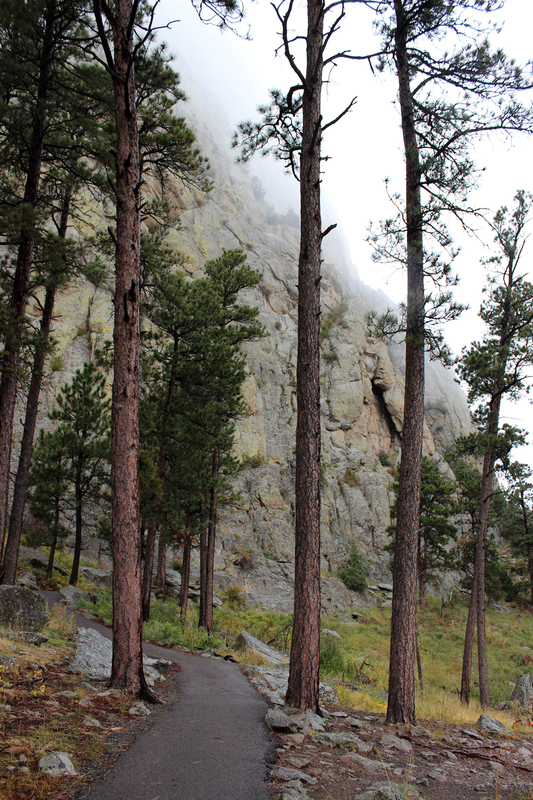 It was the afternoon of Tuesday, September 9, and while we were dining in the aura of Eva Marie Saint at the Mount Rushmore cafeteria, low, misty cloud cover had moved in across the Black Hills. The anticipated cold front had arrived. 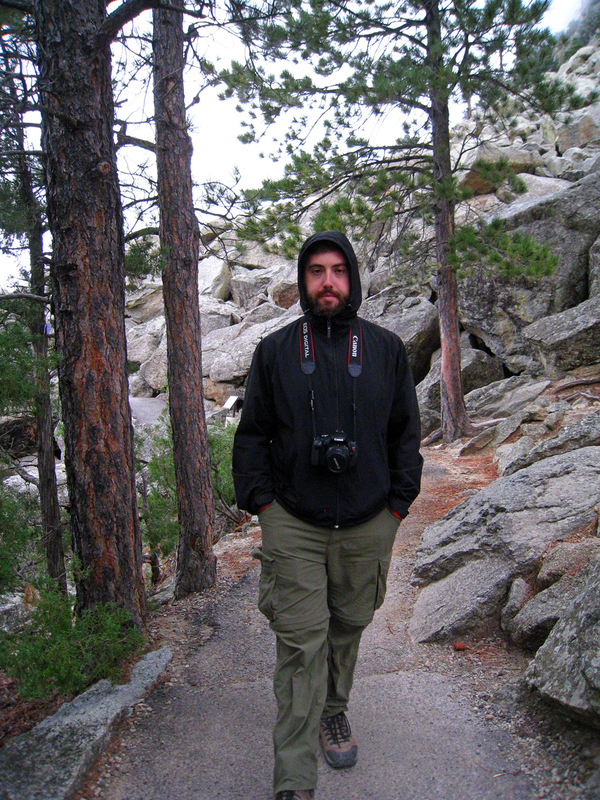 Throughout the first half of the trip, we’d been mostly clad in shorts and t-shirts. Now, anticipating temperatures dropping into the thirties while we were in North Dakota later in the week, we realized that we needed to be better prepared. 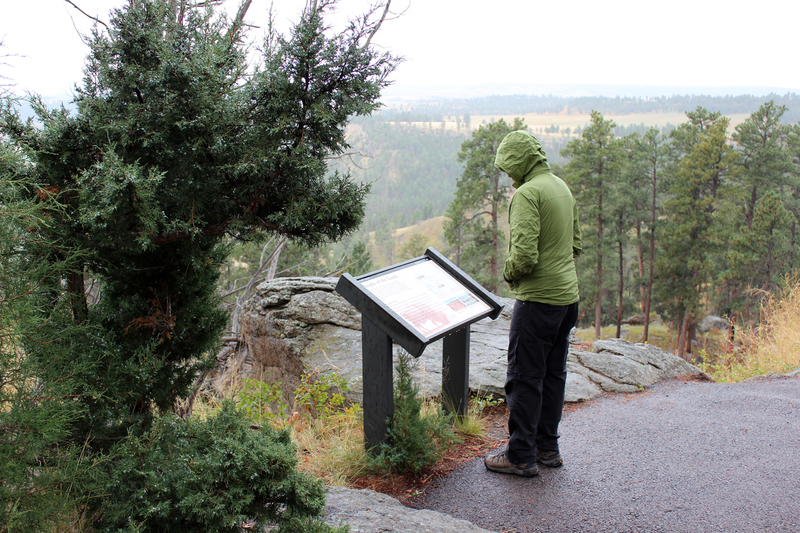 Instead of heading out of the Black Hills toward Wyoming via the Spearfish Scenic Byway, we descended into Rapid City to visit the Scheels. Sean in particular wanted to get a base layer to keep himself warm. And I got some pajama pants at Target to give myself an extra layer at night. 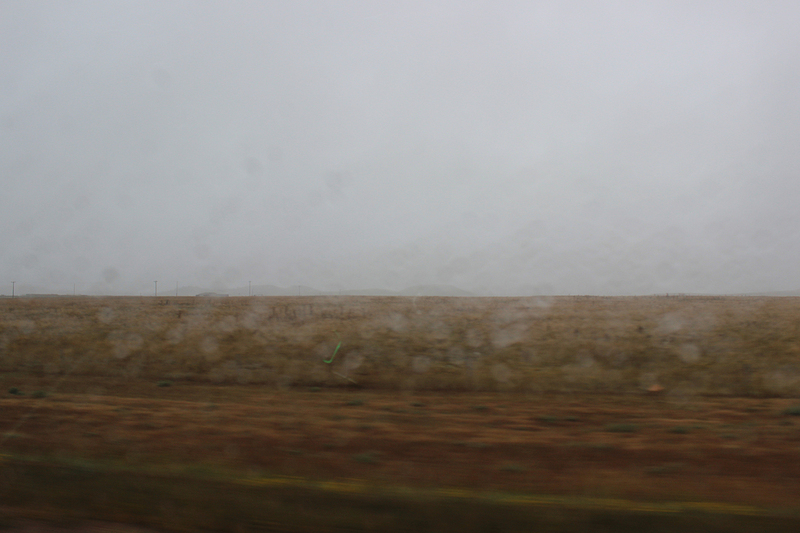 After the detour, we headed west through the drizzle and rain toward Wyoming and the motel room waiting for us in the town of Hulett, population 391, near Devils Tower. 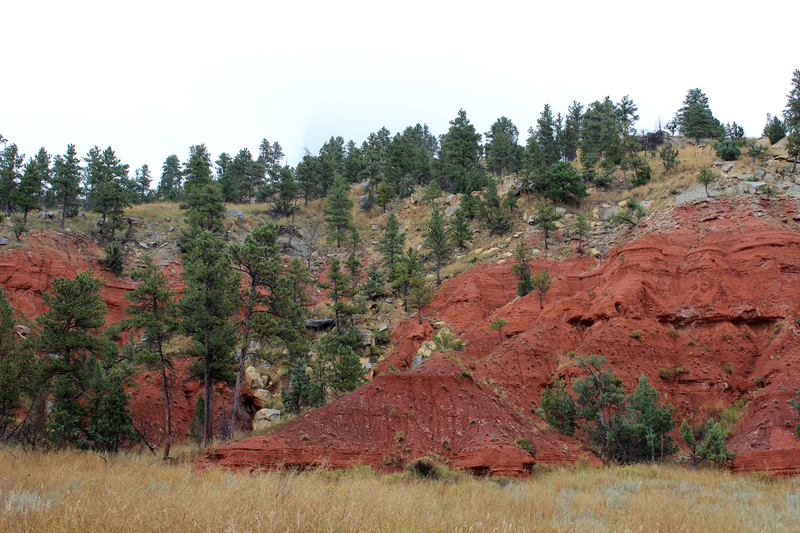 We crossed the state line surrounded by lonely ranches and then ascended into the Wyoming section of the Black Hills before descending onto the high plains that held Devils Tower. 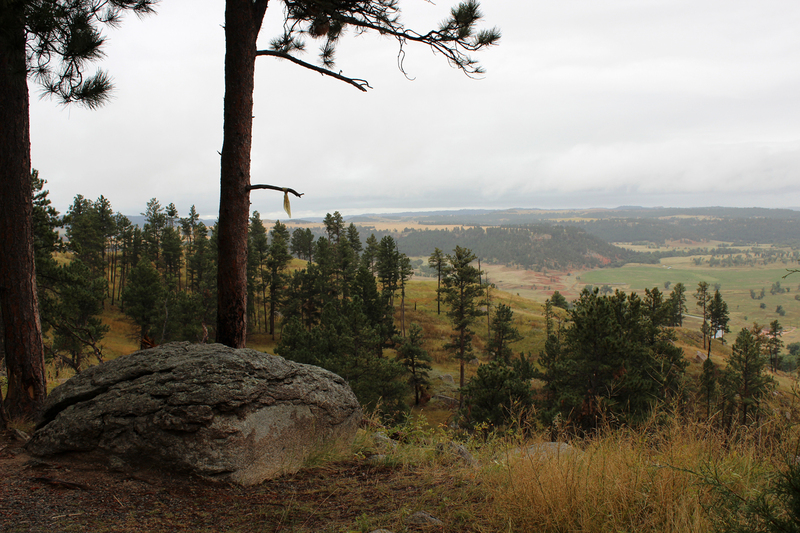 There was a scenic lookout along the road as we approached Hulett, but the tower wasn’t visible in the distance through the rain and clouds. Our stay at the Hulett Motel would be the only time we would not be camping during the trip. 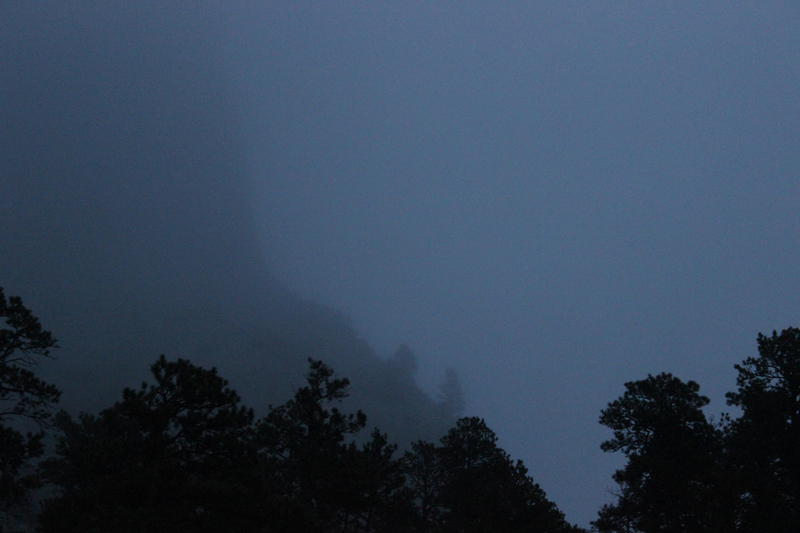 This night fell at the mid-point of the trip, the volta between South Dakota and North Dakota. I’d sprung for one of the motel’s three quaint A-frames, since Sean loves A-frames, as a surprise. 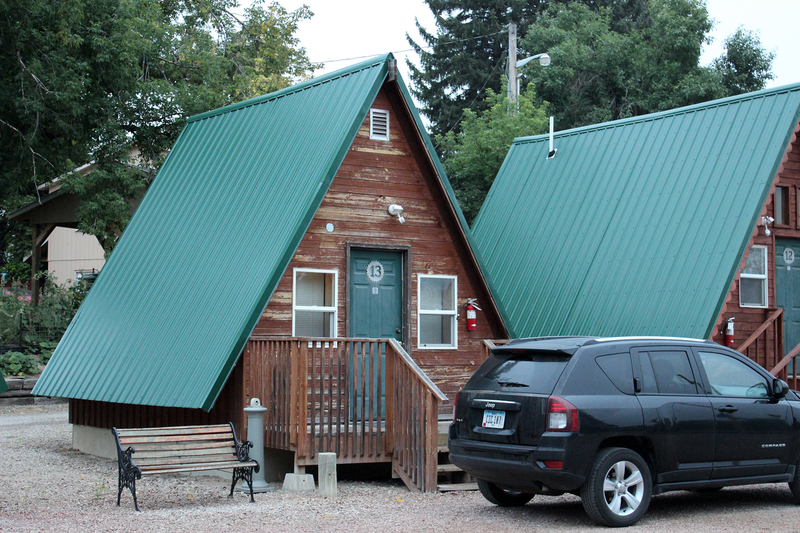 The motel was situated just on the western edge of the downtown area of Hulett. 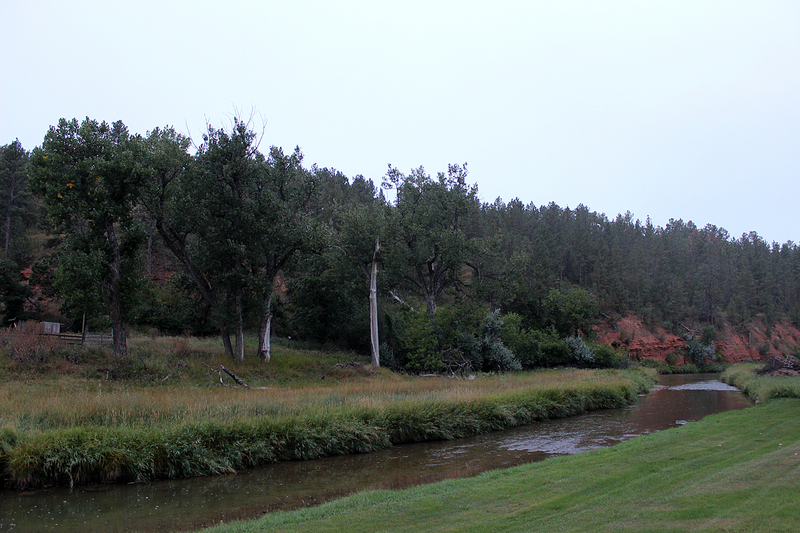 Our A-frame faced the Belle Fourche River, a tributary of the Cheyenne River, as it snaked through town. I was checked in at the motel’s front desk by a teenage girl. A fellow who appeared to be her brother was waiting tables in the motel’s cafe. My guess is that they are the kids of the family who owns the motel. By the time we unloaded the jeep, it was about 7pm. The sun wouldn’t technically set for another half hour, but it was getting very dark because of the clouds. My intention in planning the trip had been to see the sunset and the sunrise at the tower. 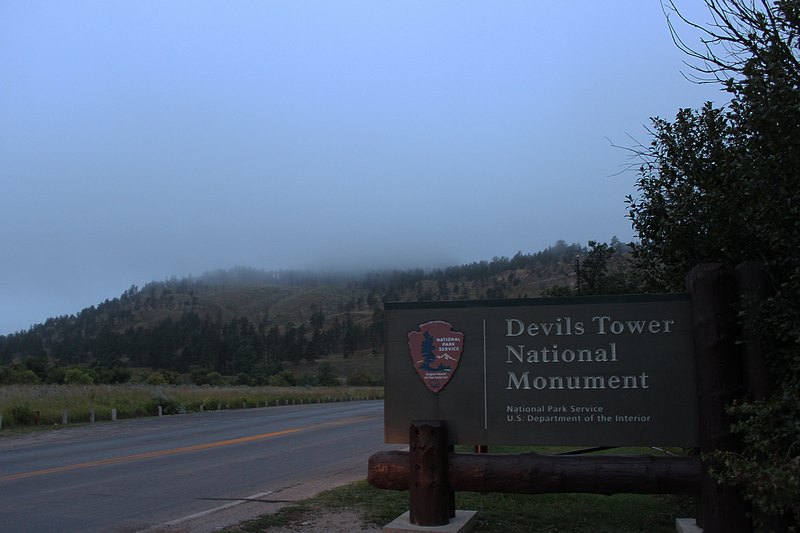 Although sunset was thwarted by weather, we decided to head out to the tower to see what we could see. 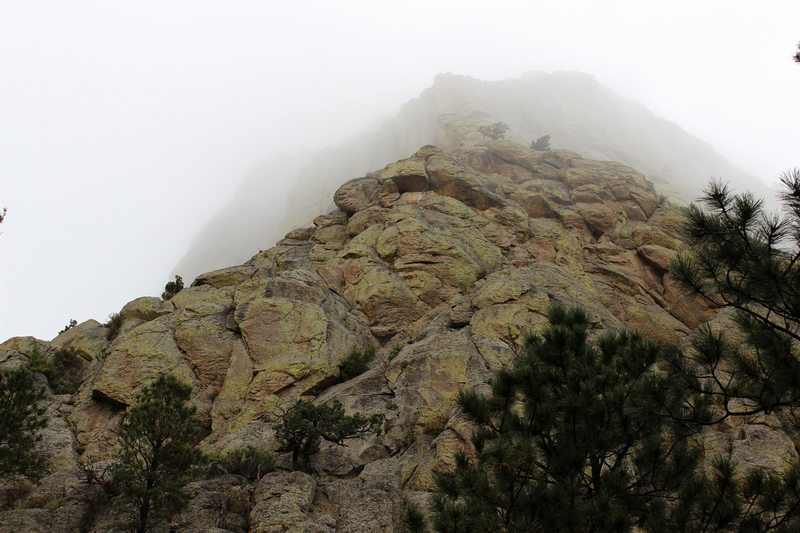 During the short, nine-mile drive from Hulett to the entrance station of the Monument, Sean played creepy, sci-fi-esque demo tracks by Owen Pallett from his Heartland album. Extremely atmospheric. 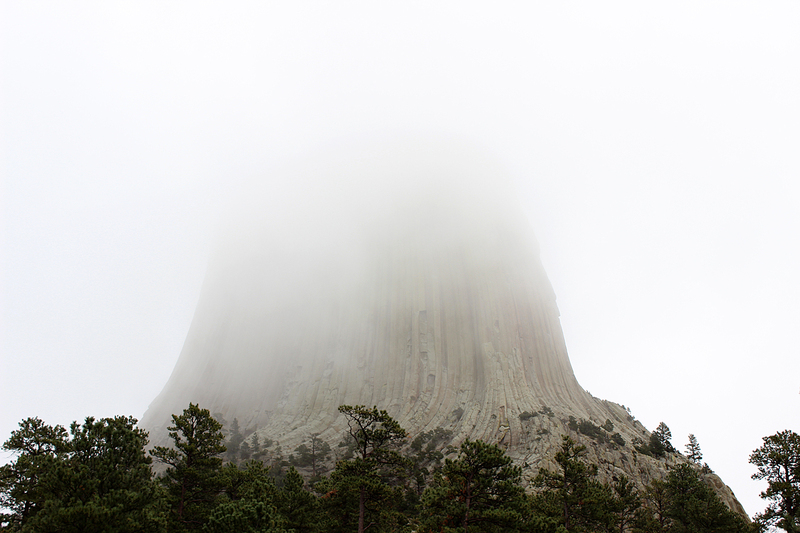 Before leaving on the trip, we’d had a movie night, hosted in Angela’s backyard, called “Close Encounters with Eva Marie Saint,” in which we’d watched North By Northwest and Close Encounters of the Third Kind to prepare us for Mount Rushmore and Devils Tower respectively. Sean had been repeatedly humming the musical phrase that the aliens in Close Encounters use to communicate with the humans. We arrived at the turn for the the Monument, drove past the privately-run campground and lodge just beyond its boundary, and arrived at the entrance station. No one was there, but we filled out a self-serve envelope to pay our fee. We knew from the map that the tower was dead ahead. In fact, it’s there in the image below, which is sort of a cheat because you can just barely see it in the photo while we couldn’t see it at all, save of a thicker darkness while we were there. We drove into the Monument, knowing the whole time that the tower was there on our right. We drove past a prairie dog town and began climbing up the tower’s foothills, its huge natural pedestal. 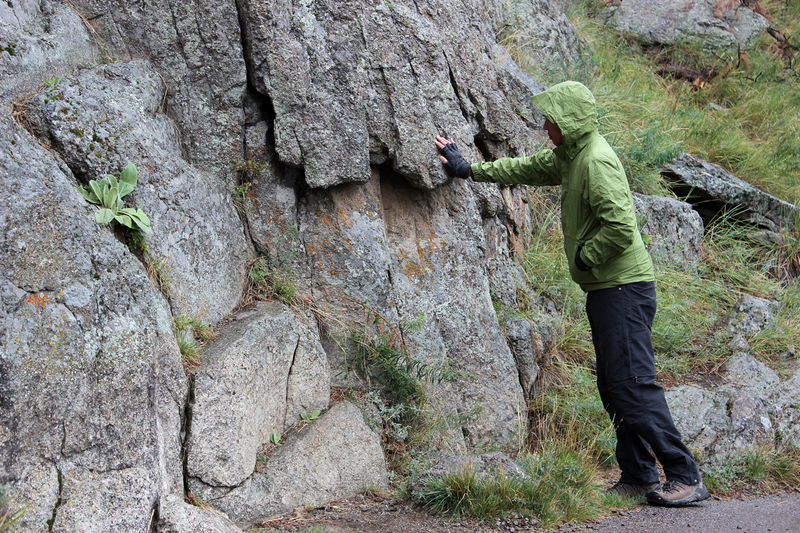 All the time we knew it was there on the right, on the right, on the right, looming invisibly above us. 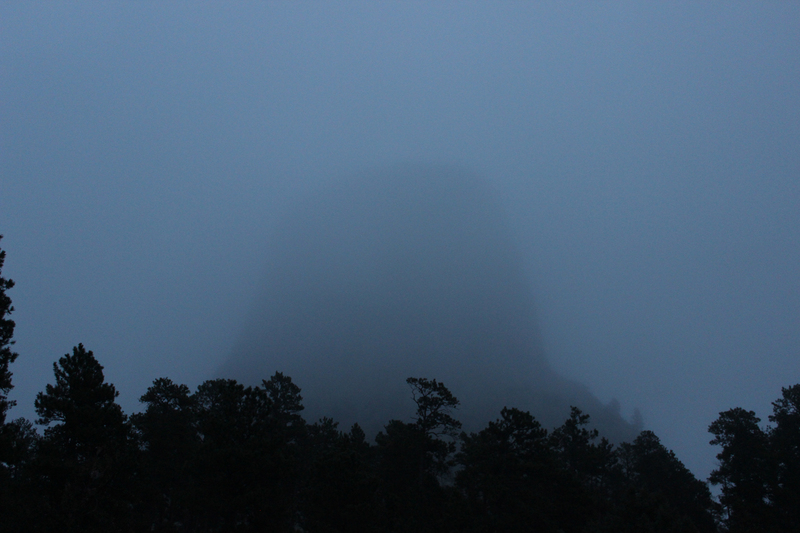 In the swiftly failing light we parked near the visitor center and gazed out at Devils Tower’s invisibility. We walked toward the visitor center, even though it would be closed. Suddenly Sean jumped and grabbed me. The tower, at this position, wasn’t on the right, it was on the left. And there it was, barely visible in the the thick mist. 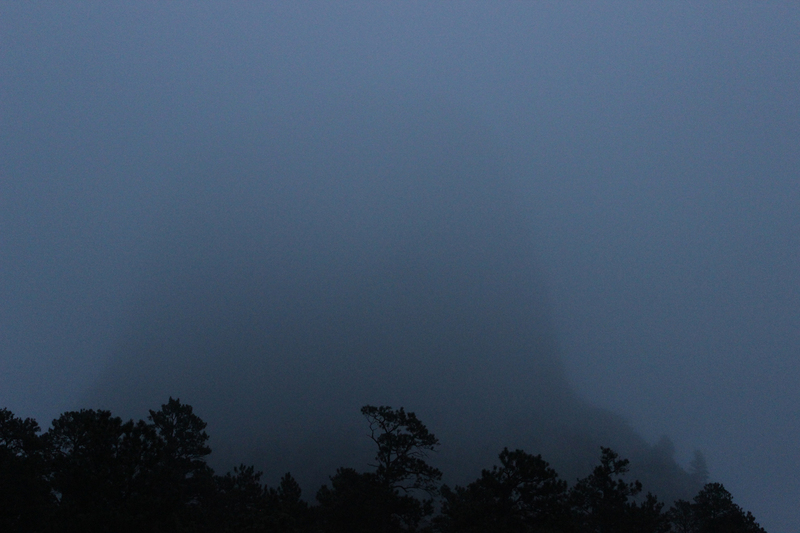 We stood and gazed at the tower for a long while as it became more and less visible in the misty twilight. The only other people were a couple from Chicago who had parked on the other side of the parking lot. She was wrapped in what appeared to be a white comforter, and they went walking off toward the tower. We returned to Hulett in the now nearly complete darkness. We arrived at the motel just after eight and walked into the cafe. I asked the young man if we could sit anywhere, and he said yes, but then looked hesitant. 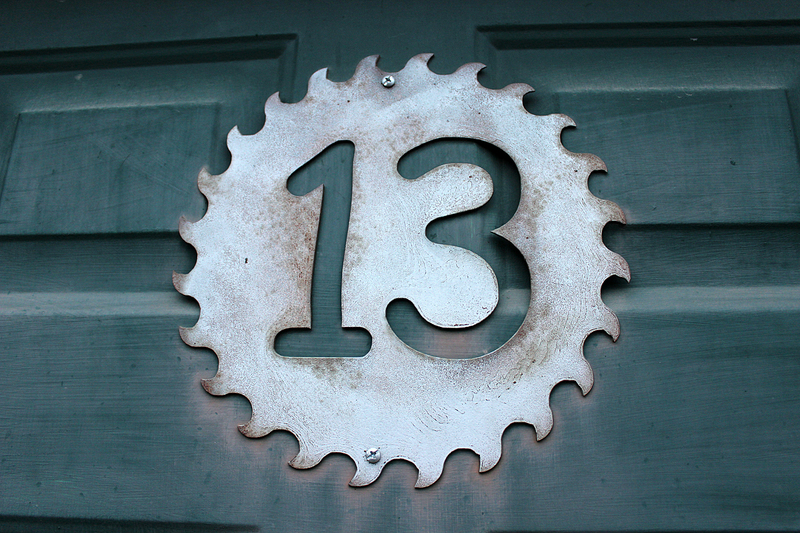 Although there were still other diners finishing their meals, it turned out that they had closed at eight, but hadn’t locked the door or turned off the sign. I said, well, if you do take out, we’ll order something and take it back to our room. He was pleased by that. So we sat and chatted about our routes to North Dakota the following morning while we waited for our food. While I was on the phone, Sean made a disappointing discovery. At Scheels, he’d accidentally purchased two tops and no bottoms of his new base layer. There was no way around it. 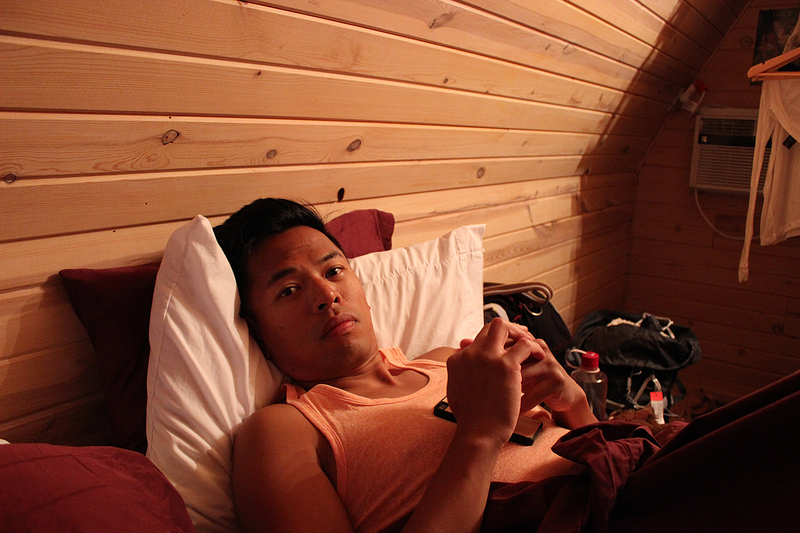 The next day, instead of driving straight to Theodore Roosevelt National Park, we’d have to head back to Rapid City so he could exchange a top for a bottom. Oof. I made the strategic mistake of rinsing out most of the moisture-wicking clothes that I’d already worn, assuming they’d be dry by the morning. Sean watched clips of Close Encounters and Janelle Monáe videos on YouTube. Most importantly, though, we showered for the first time on the trip. 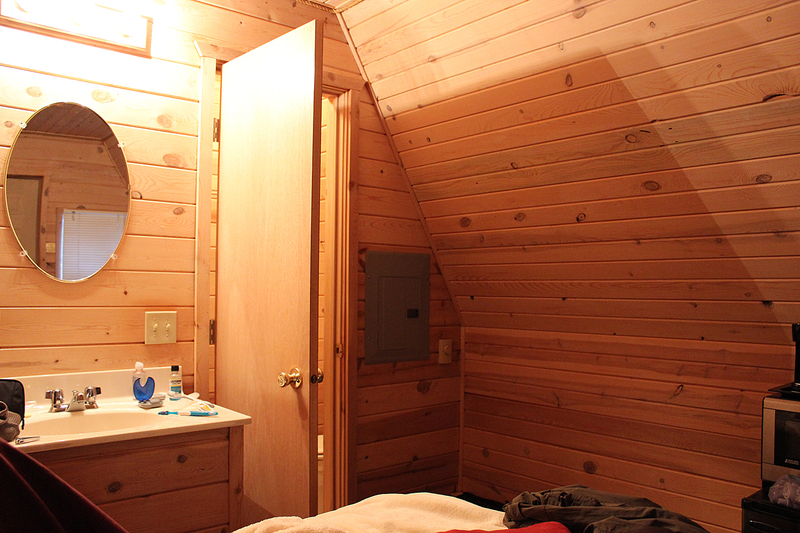 Next morning, Wednesday, September 10, it was still overcast, but the ceiling was noticeably higher. 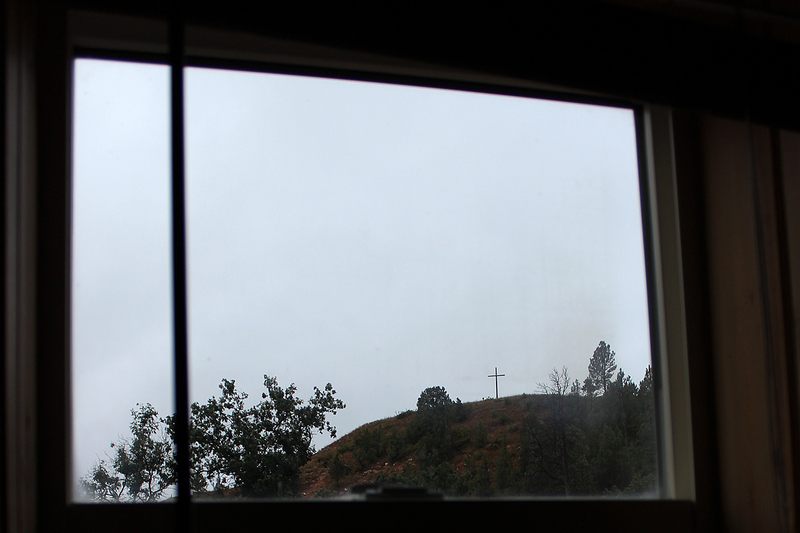 Apparently Calvary was actually located across the Belle Fourche River from the Hulett Motel. I desperately tried to finish drying my clothes on the radiators while we packed the jeep back up, but we’d be driving that day with my socks drying on the back seat and my base layer attached to the heat vents. Oops. I went into the motel and returned the key to a woman who was presumably the mom of the family who owned it. 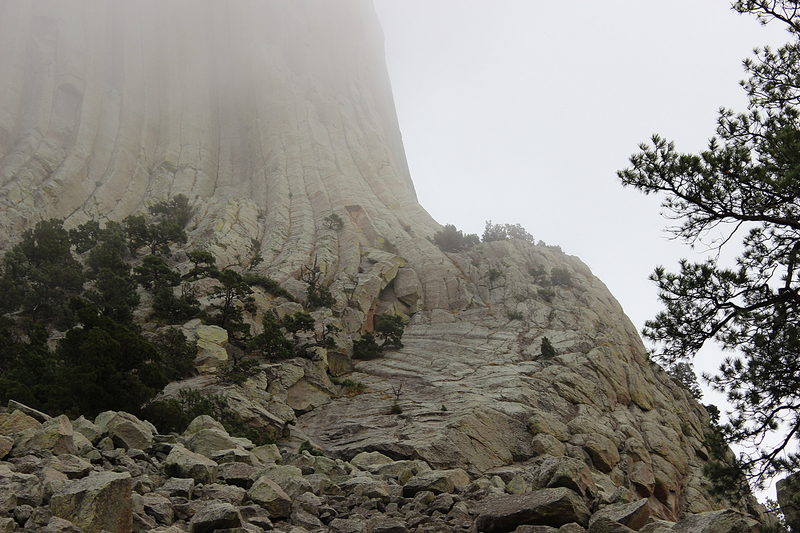 Back in the car, we breakfasted on trail mix (which I managed to spill all over the driver’s side) as we headed back to Devils Tower for another look. 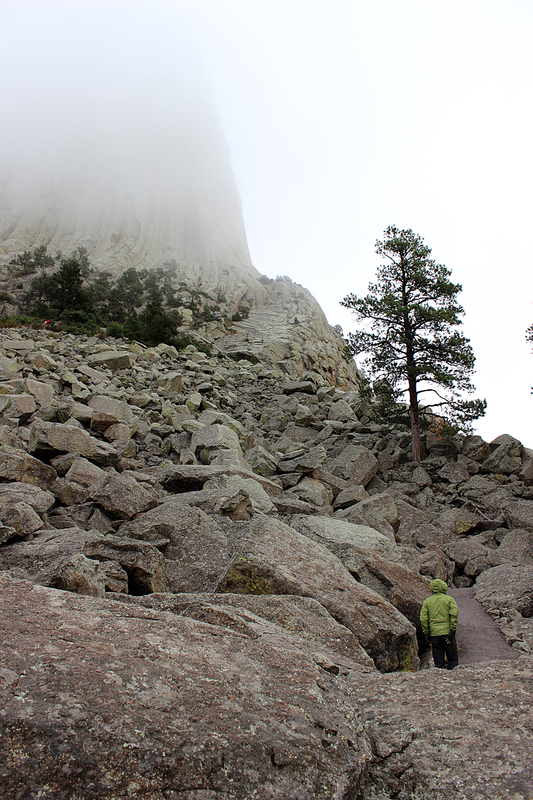 On one level, we were disappointed not to be treated to the iconic view of Devils Tower rising against the western sky. 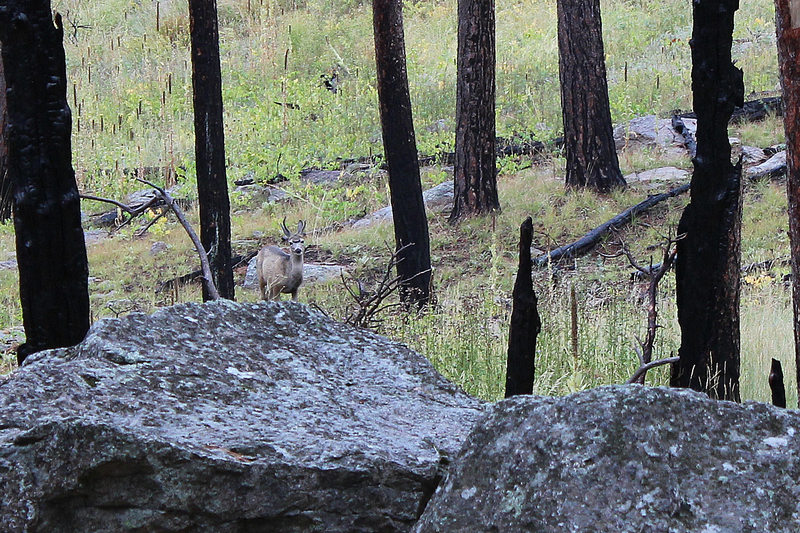 But also, we’d gotten a rarer, moodier view of it. Another side of its personality, if you will. We checked out the CCC-built visitor center to get some books and souvenirs and to stamp our passports. The woman behind the counter was originally from Peoria, Illinois. 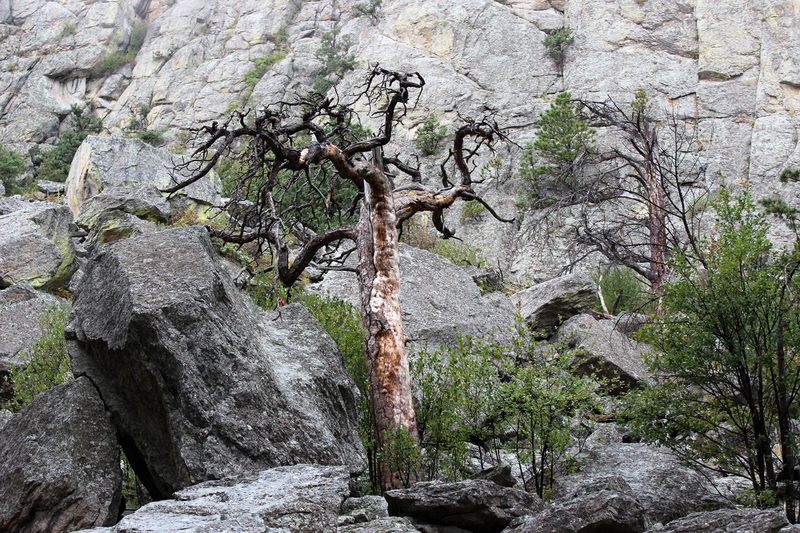 She had come out to Wyoming by train from Galesburg some thirty-five years ago and liked it so much that she’d stayed. 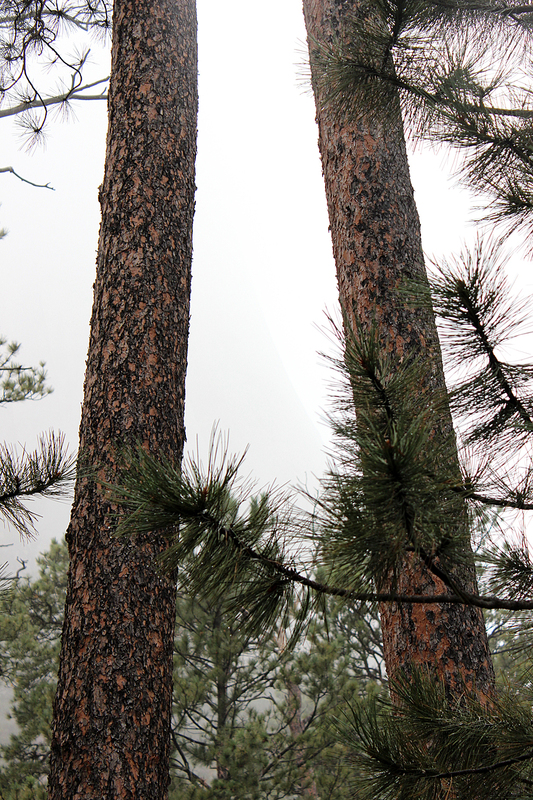 We decided to hike the Tower Trail, a 1.25-mile loop that circles the tower at the closest distance, passing at times through the boulder field and through the sparse Ponderosa Pine forest on the pedestal’s slopes. 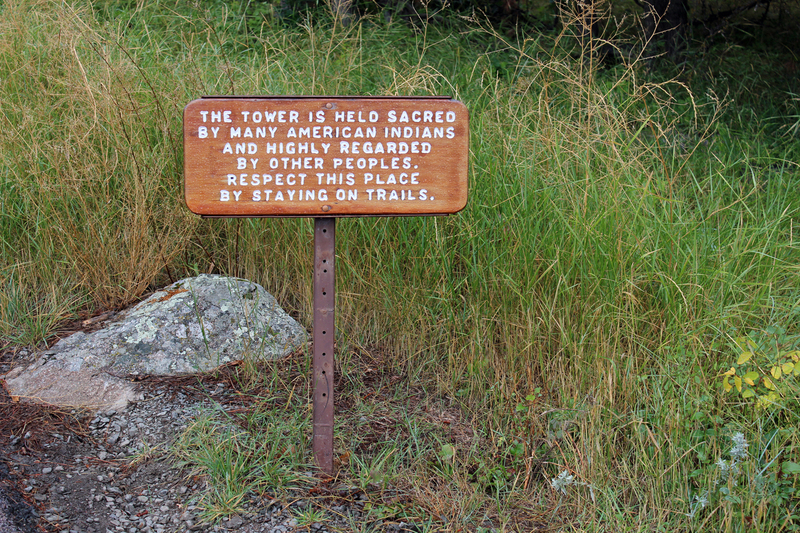 Signs on the spur trail from the visitor center reminded visitors to be respectful of the place’s sacredness in native cultures. 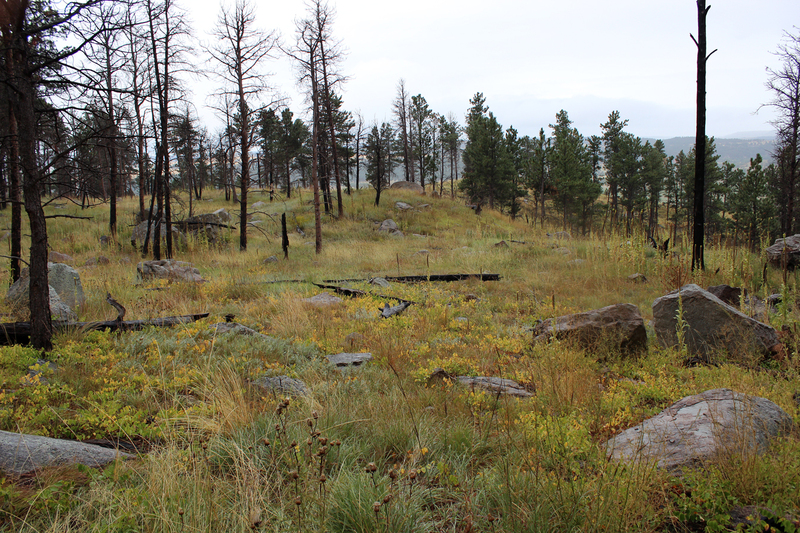 The boulder field alone was impressive, littered with huge chunks of granite that over eons had fallen from the tower. 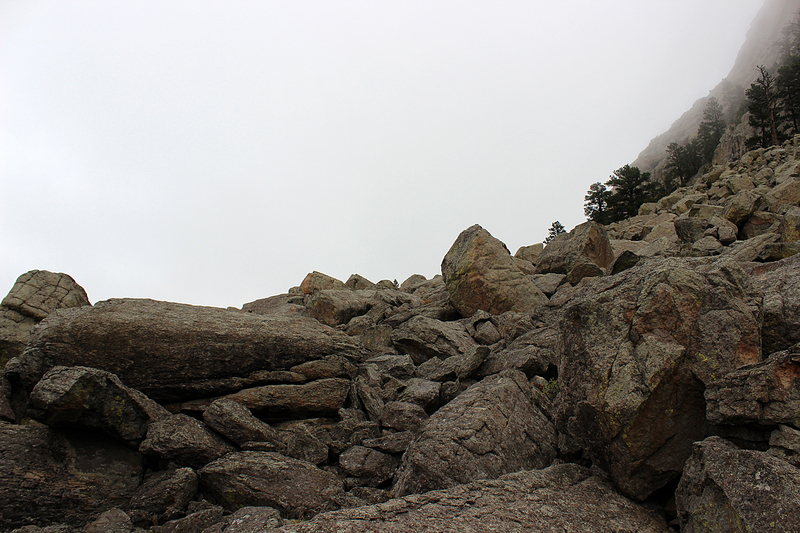 The granite is so hard and erodes so slowly, however, that no boulders have fallen from the tower in recorded history. 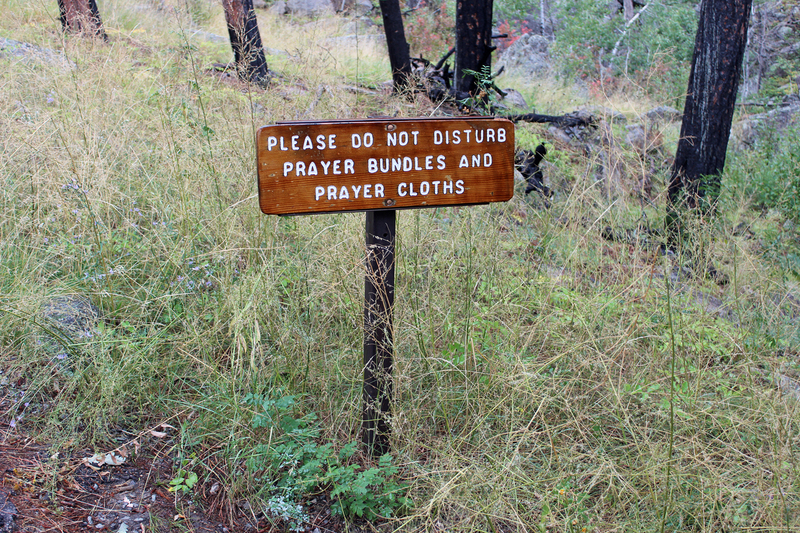 We noticed prayer cloths tied to trees all the way around the tower, which is know as Mateo Tepee or “Bear Lodge” to Native Americans. Two standard legends attempt to explain its creation. 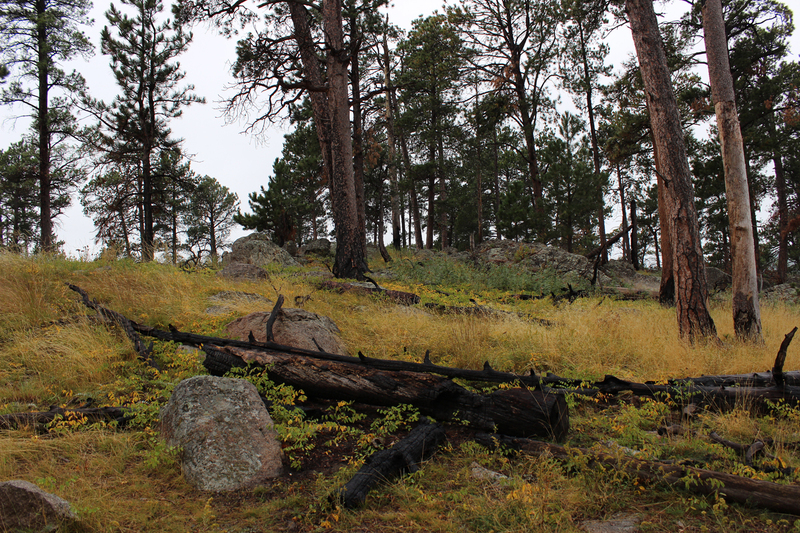 The Kiowa version says that seven little girls were playing near their village when they were chased by some bears. 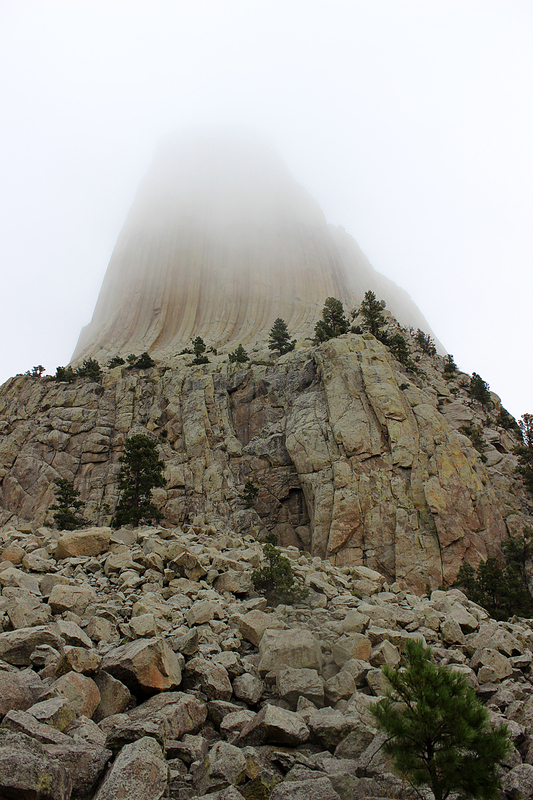 The girls climbed up onto a low rock and prayed, “Rock take pity on us, save us.” the rock began to grow higher and higher until it became Devils Tower. 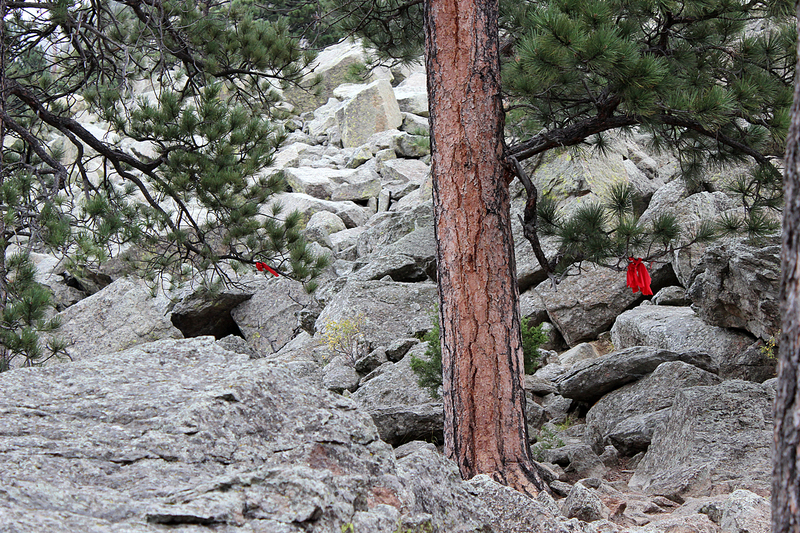 The deep score marks on its side are from the bears’ claws as they tried to climb it to reach the girls. The seven girls are now seven stars in the sky, known to Western cultures as the Pleiades. 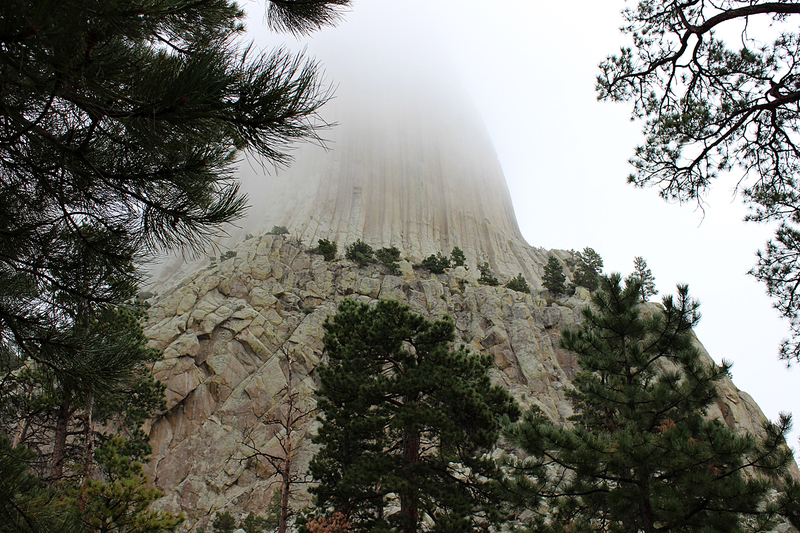 In the Cheyenne version, it is seven brothers who are rescued by the growing of Devils Tower after they rescue the bride of one of the brothers from a huge bear who had kidnapped her. After they kill the bear, which again provides the claws that deeply score the sides of the tower, the brothers are rescued from the top of the tower by eagles. 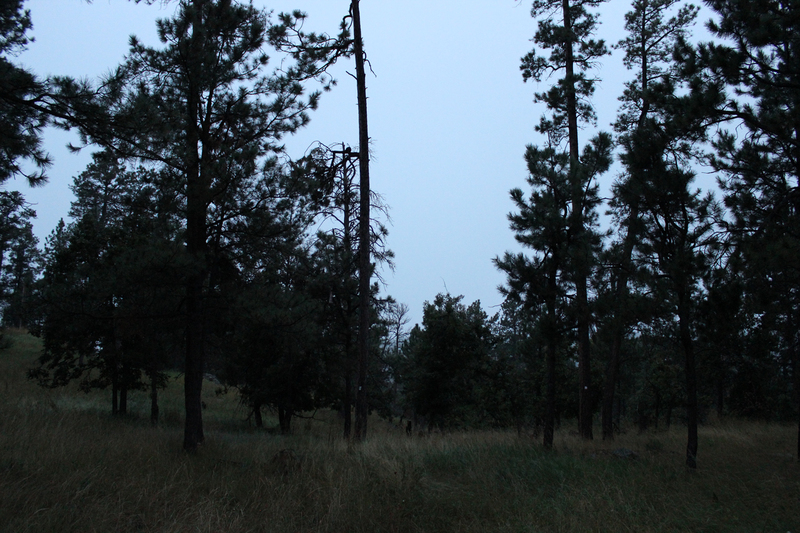 As you can see in the video below, it was raining softly the entire hike. 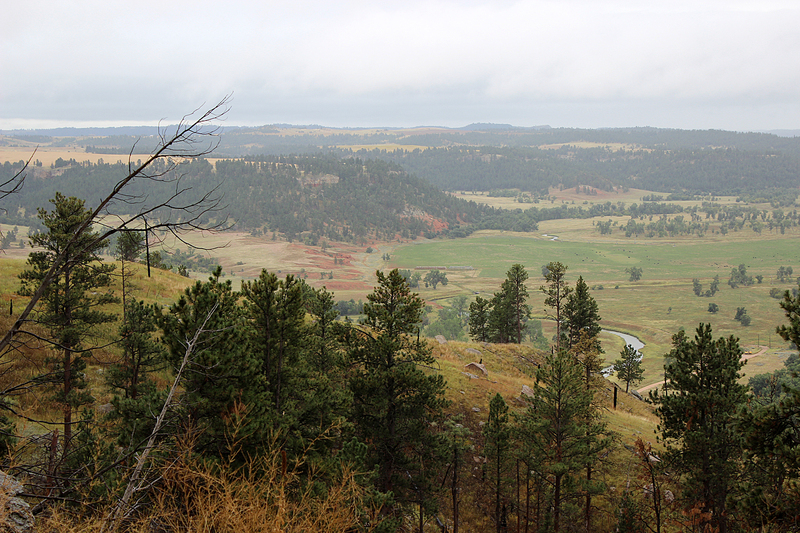 Despite the cold and the wet, we were treated to views across the Belle Fourche river toward the Black Hills. 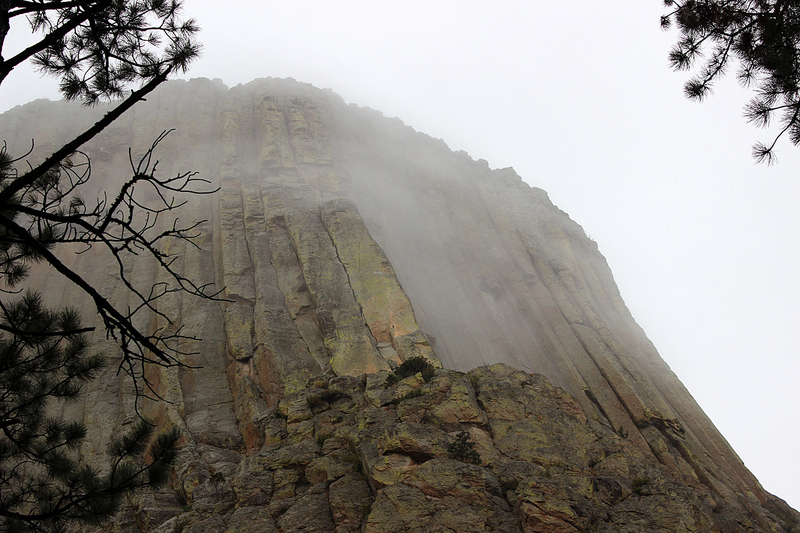 Long thought to be the core of an ancient volcano, Devils Tower is now understood to be an igneous intrusion. It was created by magma like that of a volcano, which pushed up from the earth’s mantle into the rock layers of the crust. 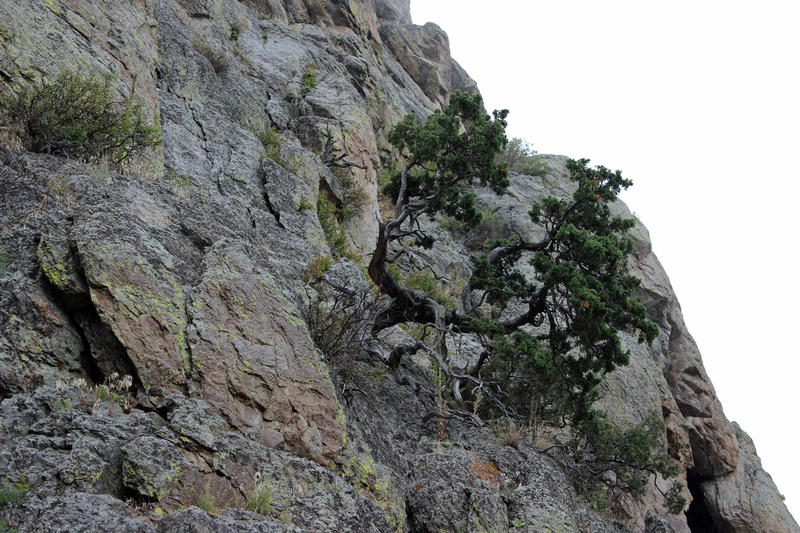 But unlike a volcano, the magma never broke the surface, but hardened into granite while still underground. 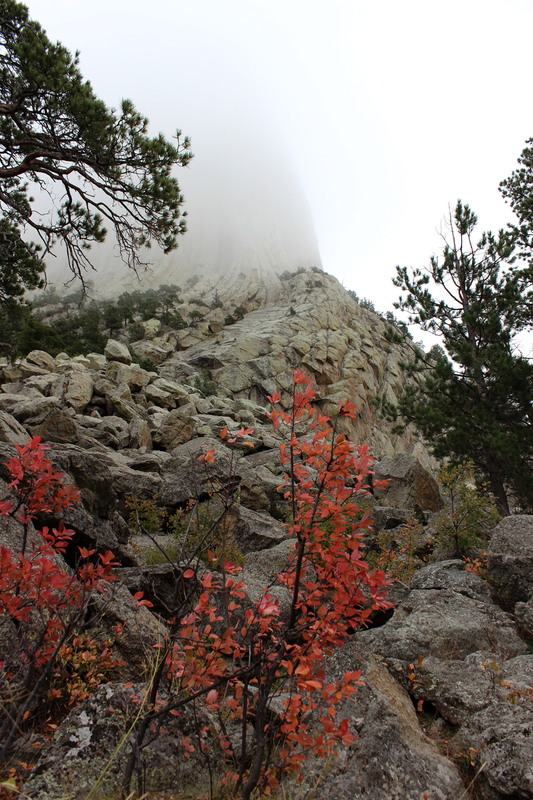 After the region was uplifted along with the Rocky Mountains and the Black Hills 65 million years ago, the softer, surrounding layers eroded away to reveal the harder, granite tower. 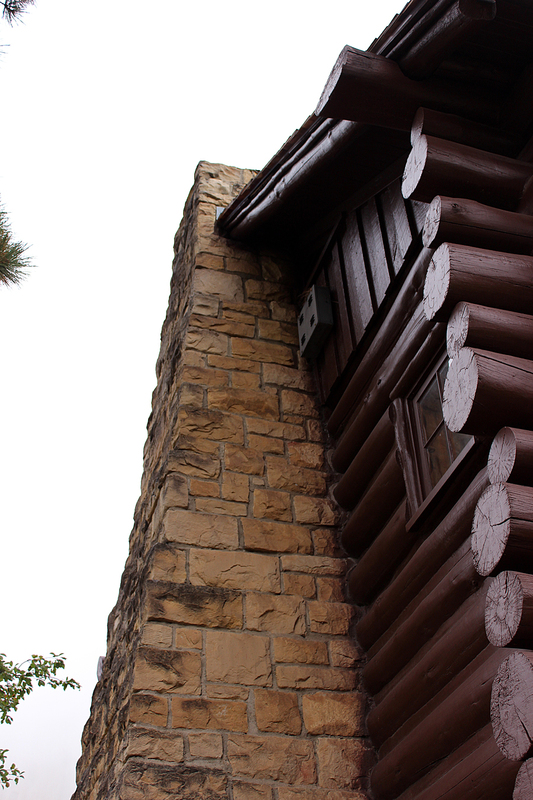 The deep scoring of the sides of the tower was created by the cellular properties of the granite, which when cooling compressed into usually six-sided columns. 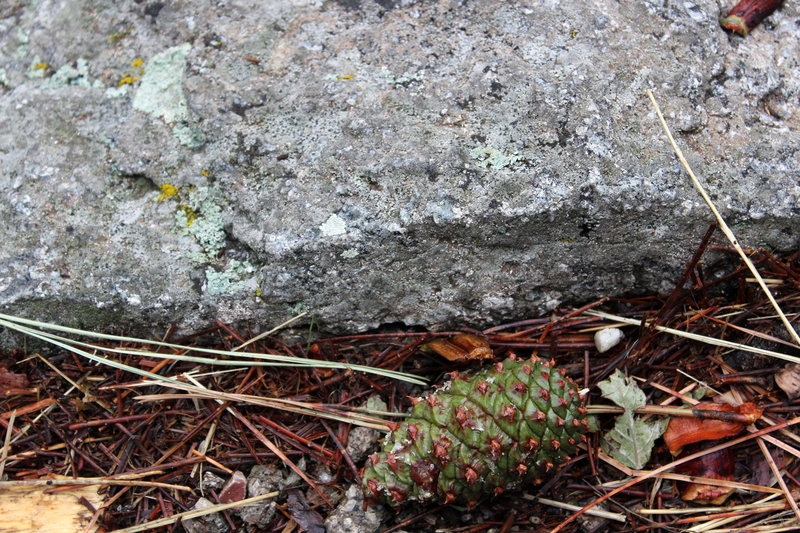 We’d seen this phenomenon before at another extremely volcanic, but now dormant landscape: Isle Royale. 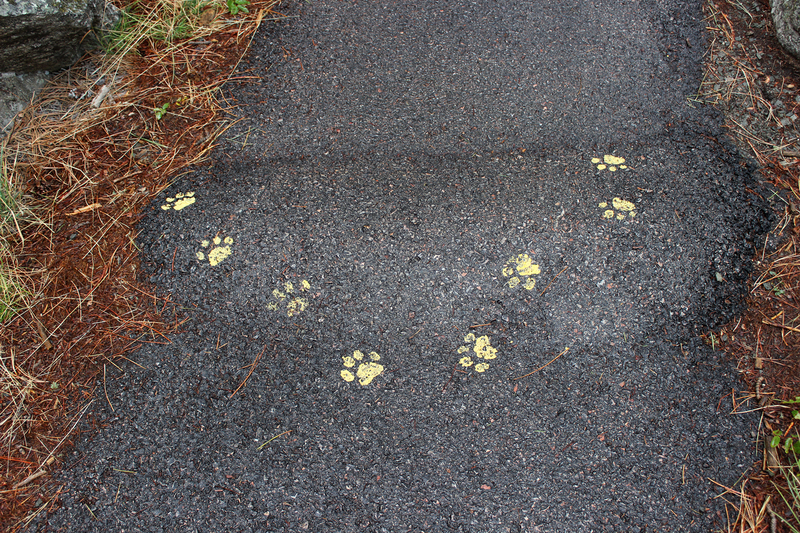 Along the trail, irregularities in the blacktop were marked with the painted paw prints of the various species found at the Monument, including human hands. On the eastern side of the tower, the wind pushed the mist away enough that we could glimpse the full height of the tower. 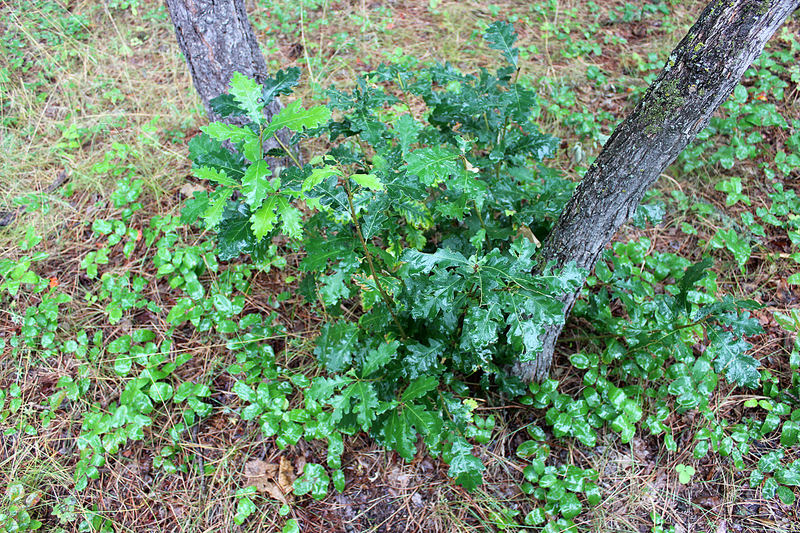 A cluster of young oaks soaks up the rain. 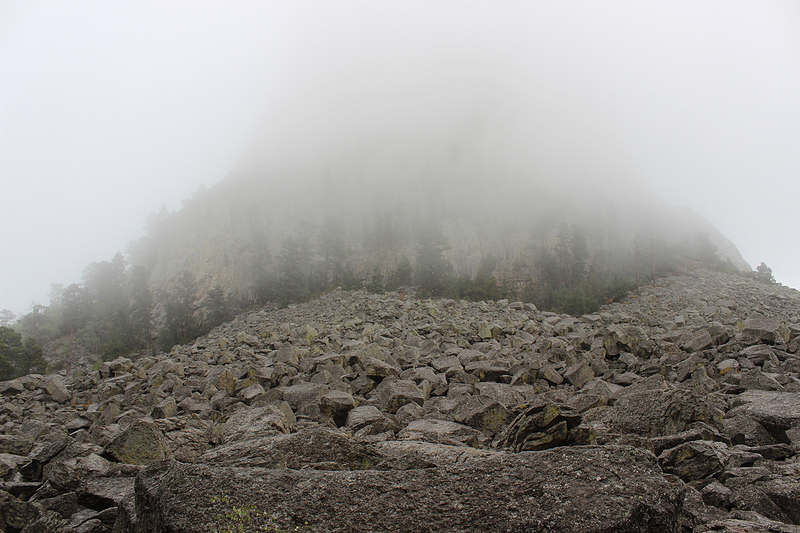 By the time we finished our hike, it was raining significantly harder, and the tower was disappearing into the mist again. Drenched by this point, but dry underneath our gear, we climbed back into the Jeep for the drive back to Rapid City and then to North Dakota. The tower gave us one last glimpse of itself as we drove out of the Monument and turned east.